Mark T. White/Stanley Park Ecology SocietyA photo of a beaver in Stanley Park in Vancouver, Canada. 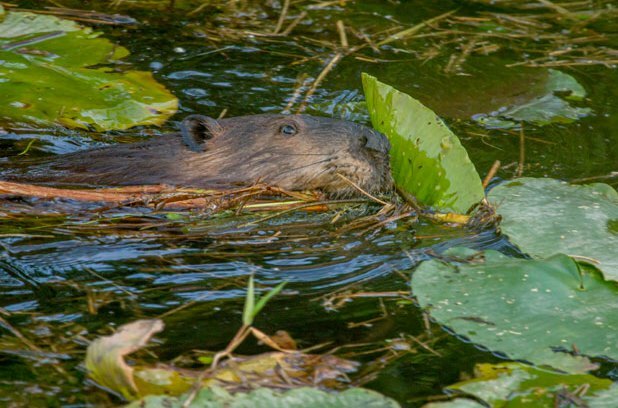 It’s a dam mystery, but a Vancouver conservationist says someone seems to be repeatedly removing the mesh wire that protects Stanley Park’s trees from overeager beavers. Robyn Worcester, conservation programs manager for the Stanley Park Ecology Society, said the group has long wrapped the park’s larger trees around Lost Lagoon with mesh wire to protect them from being chomped on by beavers. But in recent years, Worcester said someone has been regularly unwrapping the wire and tossing it in the water, putting both the trees and other wildlife at risk. Worcester said the beavers have been ruled out as potential culprits, mostly because the wire is connected with pliers that make it impossible for an animal to untie. “Not unless they have thumbs,” she said with a laugh. That has left the society speculating that a person must be behind the wire removal and that they must believe they’re helping the beavers, said Worcester. Worcester said the society leaves the park’s smaller, fast-growing trees unwrapped so the beavers still have access to food and material for building lodges. Although the society’s goal is to keep the beavers healthy and happy, she said it also has to take steps to protect the park’s vegetation for other animals. If anyone sees someone tampering with the mesh wire, Worcester said she hopes they educate them that the material is important for protecting the park habitat.